(Reuters) - Pfizer Inc's Xalkori delayed progression of lung cancer longer than chemotherapy in patients who had never previously been treated for the disease, according to results of a late-stage study released on Tuesday. The medicine, which received U.S. approval in 2011 for lung cancer patients who have a specific gene mutation, had shown in a previous Phase III trial that it significantly delayed disease progression among those who have already undergone chemotherapy for non-small-cell lung cancer, the most common form of the illness. Pfizer said favorable results from the latest trial, combined with those from the earlier big study, establish that Xalkori is appropriate for first-line as well as second-line use, meaning for patients receiving initial treatment as well as for those who have already undergone chemotherapy. The drug is used among patients who have a mutation in the so-called ALK gene, as determined by an approved diagnostic test. The mutation only occurs in a small percentage of patients with lung cancer, but makes them good candidates for treatment with Xalkori. Xalkori, with current annual sales of about $350 million, is expected to get a significant boost from the new data. Cowen and Co has predicted the medicine will generate annual peak sales of $1.05 billion by 2020. Pfizer is also developing an array of other cancer medicines that work through new mechanisms, with the aim of becoming a major player in the oncology field. 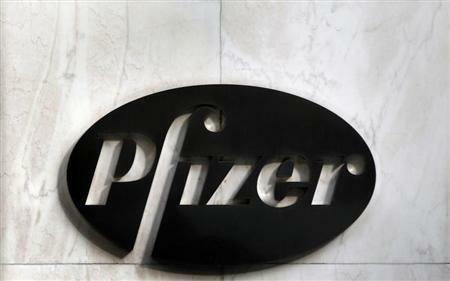 Pfizer shares were up 0.6 percent at $31.67 in midday trading on the New York Stock Exchange.